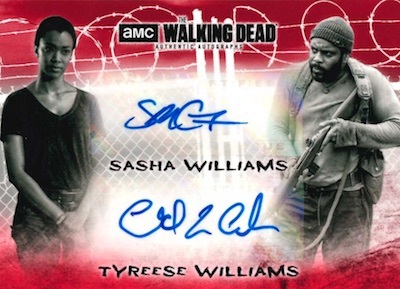 Branching out from the season-by-season sets, 2018 Topps Walking Dead Hunters and the Hunted provides an overall look at TWD, including one guaranteed autograph in every two-hit box. The 2018 Topps Walking Dead Hunters and the Hunted checklist starts with 100 base cards highlighting many of the key subjects from across the run of the series. Orange parallels fall in every pack and are joined by numbered Blue (#/50), Green (#/25), Purple (#/10), Black (#/5), and Red (1/1) versions. There are also limited base Variations showcasing short-printed images. Insert choices include Epic Battles cards that recount the big fights and the results for each, plus the Leaders insert, for the various characters in charge. 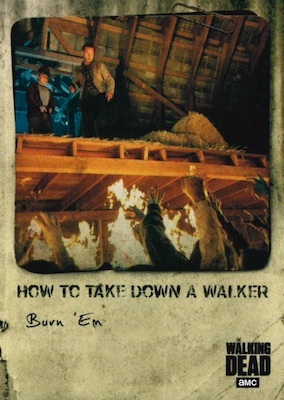 In addition, How to Take Down a Walker details some of the more unique ways to stop a walker. 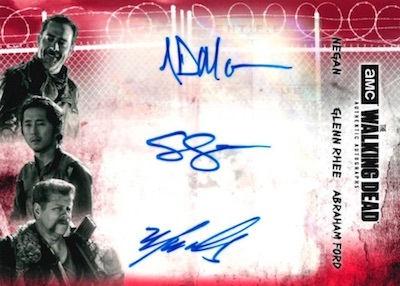 Hits in 2018 Topps Walking Dead Hunters and the Hunted center mostly around cast autographs and costume relics. However, there are one-of-one Sketch cards featuring original artwork, as well. Matching the gritty tone of the show, the signature cards in Hunters & the Hunted display a barbed wire background. Joining the base Autograph set are Rust (#/99), Blue (#/50), Mold (#/25), Sepia (#/10), Red (1/1), and Printing Plates (1/1) versions. More signed variety comes in the limited Dual Autograph and Triple Autograph lines. Both of these sets have Red (1/1) and Black (1/1) parallels, and the Dual insert adds Purple (#/10). Incorporating wardrobe pieces, the Costume Relic cards work with Orange (#/99), Blue (#/50), Green (#/25), Purple (#/10), Black (#/5), and Red (1/1) parallels. 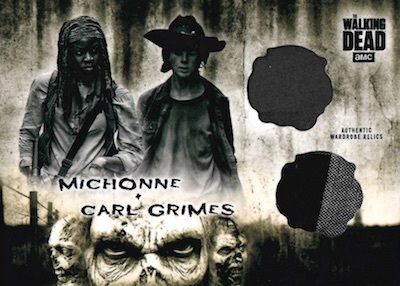 2018 Topps Walking Dead Hunters and the Hunted builds on that with Autographed Costume Relics, Dual Costume Relics and Dual Costume Relic Autographs (#/10). All three present Red (1/1) and Black (1/1) parallels, while the main dual relic and auto relic cards also have Purple (#/10) parallels. Buy TWD Hunters and Hunted boxes direct from Topps. PARALLEL CARDS: Orange (1 per pack), Blue #/50, Green #/25, Purple #/10, Black #/5, Red 1/1. 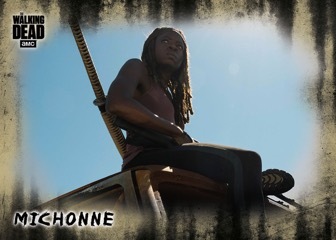 Buy TWD Hunters and the Hunted autographs on eBay. PARALLEL CARDS: Rust #/99, Blue #/50, Mold #/25, Sepia #/10, Red 1/1, Printing Plates 1/1. PARALLEL CARDS: Purple #/10, Black #/5, Red 1/1. PARALLEL CARDS: Blue #/50, Green #/25, Purple #/10, Black #/5, Red 1/1. PARALLEL CARDS: Orange #/99, Blue #/50, Green #/25, Purple #/10, Black #/5, Red 1/1. 44 artists. Serial numbered 1/1. 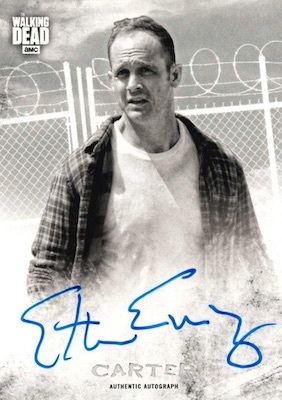 Got one box of “hunters and hunted” for Christmas yesterday wouldn’t believe what the hit pack/card was…..an autographed printing plate of Ethan Embry (Carter).